WhatsApp’s much-anticipated “Unsend” feature has been rolling out since October 2017. WhatsApp users can now retract messages which they regret sending in the first place. The feature, which is officially called “Delete for Everyone” has also been widely referred to as “Recall” and “Revoke”. The "Delete for Everyone" feature works on all types of messages, including text, images, videos, GIFs and documents. Prior to this, deleting messages on WhatsApp was only for the user, YOU. 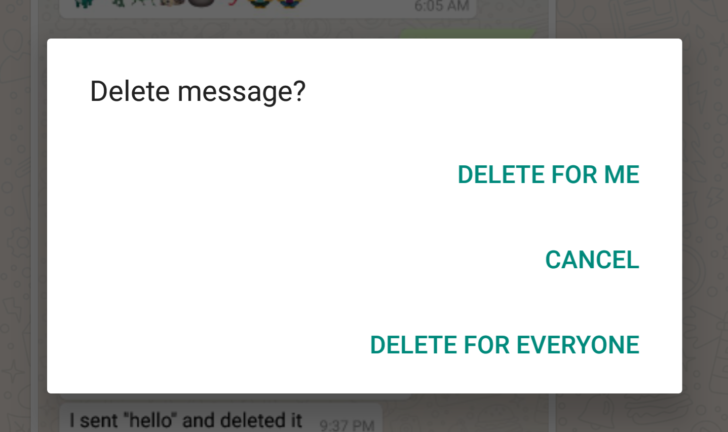 Now, you can delete WhatsApp messages after the message has been sent and delivered. This means WhatsApp users can now either delete messages for themselves only, or delete messages from everyone else's phone on a forum so that noone has access to it. However, if your reader has already seen the message, deleting it from his phone may not make him forget. This is an exciting feature, however, there is a little caveat you must bear in mind. If you wish to delete messages from other people's phones, you must do so within 7 minutes of sending that message, else you loose the ability to delete it from their phone. WhatsApp says you will not be notified if Delete for Everyone has not worked for you. It also warns that, even if the feature does work successfully, there’s a chance the person you’ve been chatting to may have already seen the message before you decided to revoke it. Using an iPhone or a Windows phone?